I’ve broken down my 2015 aspirations into month-to-month goals. If you’re interested, you can also check out my May Goals, May Recap, June Goals and June Recap. Let’s see how I fared with my July goals! I will admit that I read a couple of these and thought whoops. Clearly, I need to be more intentional about the monthly goals I set or consider choosing less than five. On the bright side, it’s been a whole year since I started running! There were series of long gaps of no running (see: injury), but overall, it’s nice to see how far things have come. Here’s how I did in July. Slowly work in more running. 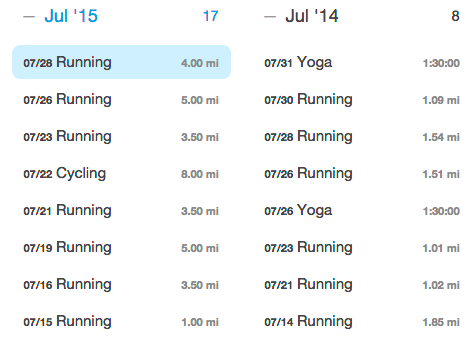 July recorded my highest monthly mileage, but it is also the first month in which the mileage was run and walked. I know this has allowed my to complete the half marathon training mileage without injury, but I have been pushing the time I spend running vs. walking more than I should. I blame the antsy-ness (I want to run it all), but I’m working on it. Ultimately, I’m just thrilled it’s getting done. Cross train 2x per week. Not so bad! I’ve been enjoying cycling on the stationary bike, but it hasn’t consistently happened twice every week. This upcoming month will also require me to find a plan B as I move away from an apartment with a gym. Stretch 4x per week. I did not do this…it happened inconsistently once or twice a week, but mainly when I remembered that I hadn’t stretched in a week. No good. Do shin strengthening exercises 4x per week. Another fail. I need to make friends with my resistance band again. Cook more meals. Win! There were definitely more home-cooked meals in the house this month, but the majority of it was spearheaded by Alex. I chose the recipes and helped with the shopping, but he cooked most of our meals when I worked late. Our new favorites? 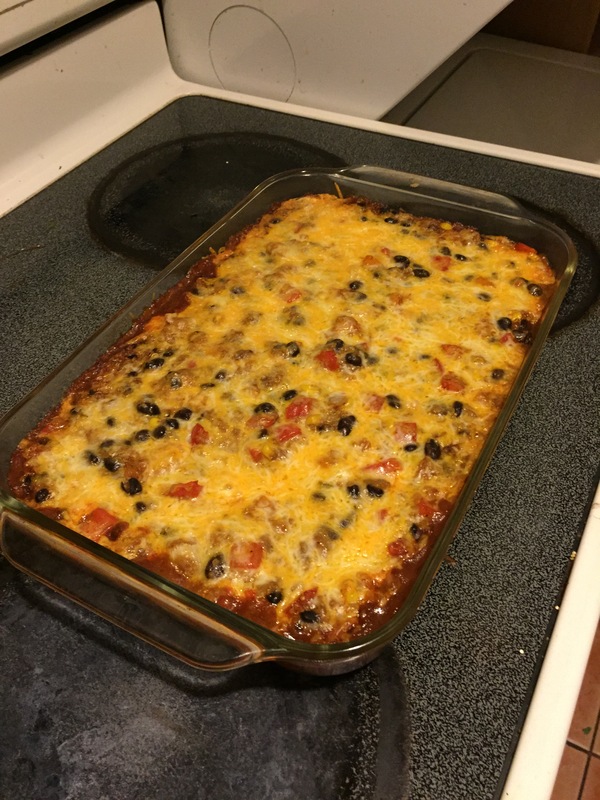 Black bean, quinoa enchilada bake (so good) and vegan cream of mushroom soup (from a recipe book). Tried and true favorites? Oh She Glows chana masala, Runner’s World mushroom tacos and our go-to chili. Stay tuned for August goals tomorrow! How did your July goals fare? What’s your favorite recipe this month?